Worker honey bees sharing food. Photo by Z-Y. Huang. 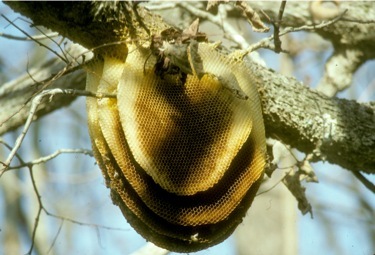 Honey bees nest in large cavities such as hollowed-out trees. They take well to other enclosed spaces, whether these occur in nature or are made by humans. Humans have taken advantage of this habit by creating bee hives-- boxes that have an appropriate entrance and are the right size and shape to house a colony of honey bees. From wax secreted by glands in their abdomens, honey bees build vertical sheets of hexagonal honey comb, in which they store honey and pollen. An individual honey comb hexagon (called a cell) can instead serve as home for a single developing bee larva, which is fed secretions from the heads of adult bees, and eventually undergoes metamorphosis to become an adult bee. A feral honey bee colony, showing the vertical arrangement of honeycombs. This colony was extremely unusual because it was out in the open. Photo by S.A. Cameron. Bumble bees usually nest on the ground in the abandoned remnants of rodent nests or in patches of dried grass. 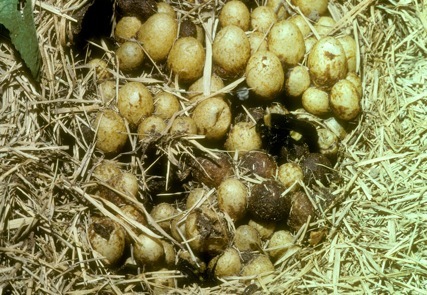 The nests are usually lined with mammal fur or soft plant material. Bumble bees use wax secreted by their abdomens mixed with pollen to make oval cells in which nectar is stored or pollen is packed. 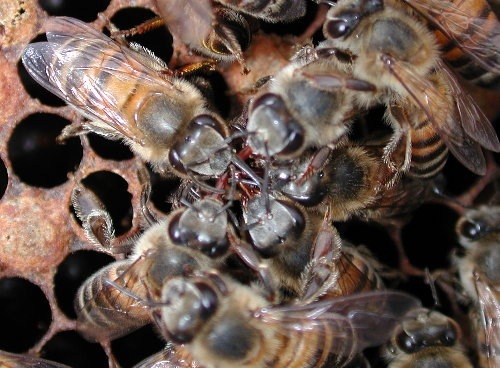 In other cells, the queen lays eggs and then the growing larvae are fed honey and pollen by adult bees. There are usually several eggs per cell. Although both honey bees and bumble bees have nests consisting of various cells, the size and shape of bumble bee cells are much less regular than honey bee comb. An end of season colony of the American bumble bee Bombus pensylvanicus. The egg-like structures are cells that contain developing bees. This photo highlights the oval and irregularly sized cells typical of bumble bees. Photo by S.A. Cameron. Among adults, there are several different types of bees that may look very different from each other. At certain times of the year, there will be some male bees present in bee colonies; males are called drones in honey bees. The rest of the bees in the colony are females, which includes the two main castes: the queen and the workers. All of the important colony social activities are carried out by females. Males, on the other hand, mostly hang out and eat and eventually leave the colony to mate, after which they die. Male bees cannot sting. 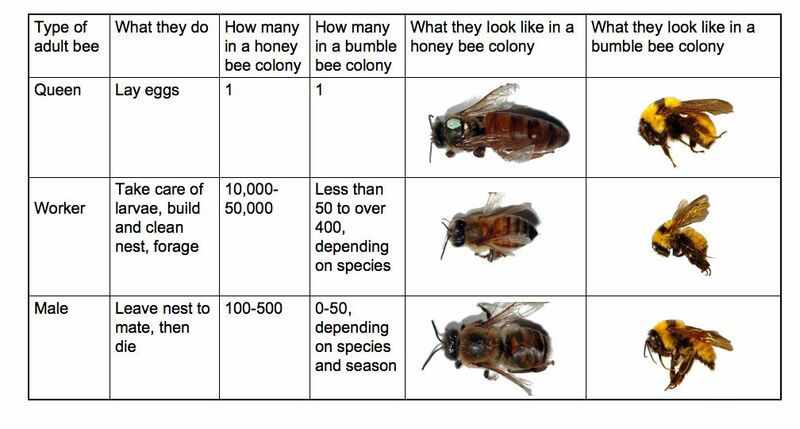 The table below gives information about the three main types of adult bees found in honey bee and bumble bee colonies. Honey bee photos by Z-Y. Huang. Bumble bee photos by C. Rasmussen. The life of a worker bee is short, but complicated. Worker bees have their own division of labor, where each bee specializes on a specific type of work that helps the hive. In honey bees, age has a lot to do with the job that each bee does for the colony. In general, young bees (0-3 weeks of age) are homebodies that work in the nest and older bees (3-7 weeks of age) spend much of their time outside of the hive. 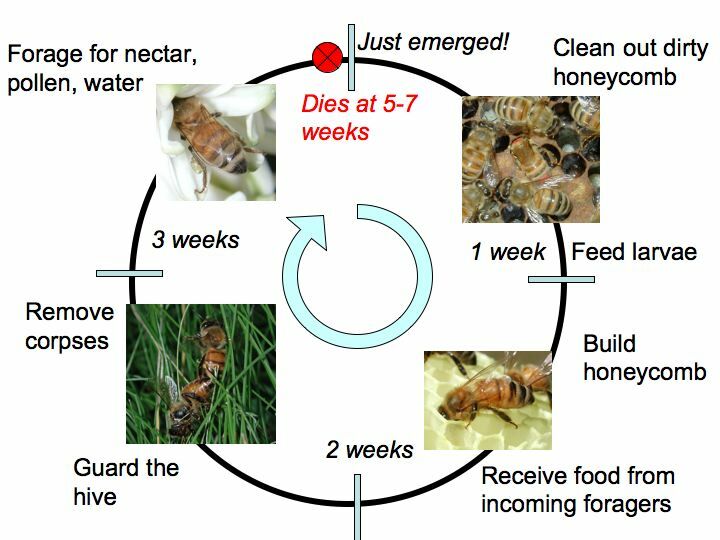 The diagram below shows the jobs that an individual honey bee worker might do over the course of her lifetime. Like honey bees, most species of bumble bees are eusocial. However, there are several big differences in how bumble bee and honey bee colonies are organized. First, unlike honey bee colonies that can live for many years, bumble bee colonies are annual, meaning they begin new colonies from scratch every year. Also, their colonies are generally much smaller than those of honey bees; the number of bees per colony ranges widely among species (from fewer than 100 to over 400 females). Although bumble bees also have a division of labor with some worker bees specializing on foraging or nest work, a bumble bee's age is not nearly as good a predictor of what her job is in the colony. Rather, there is size variation among workers and larger workers tend to spend more time foraging and smaller workers work more in the nest. Unlike honey bees, queen and worker bumble bees usually look the same, although queens are normally quite a bit larger than workers. In some species, worker bumble bees will fight with each other and the queen and try to lay eggs. 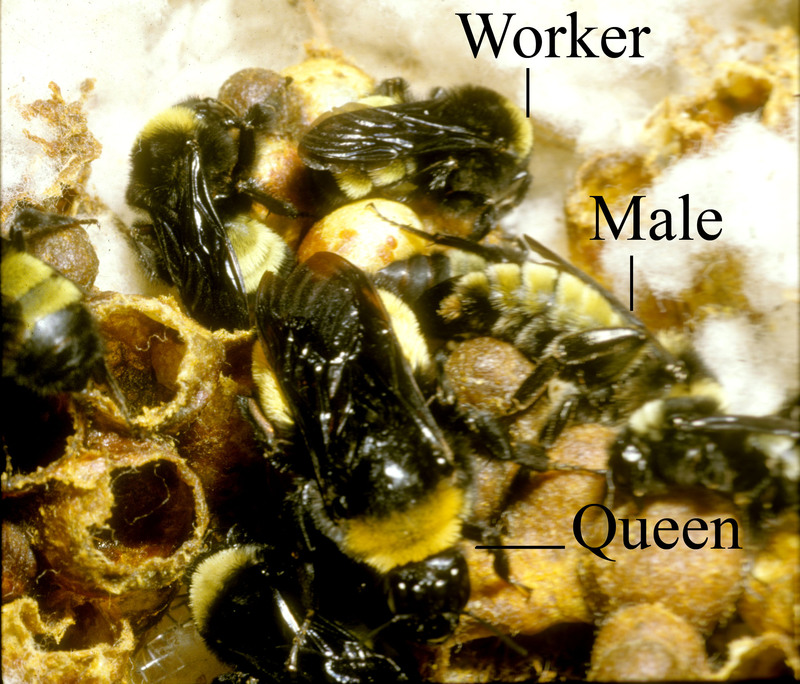 The queen is able to maintain her status as the prime egg-layer of the colony using a combination of aggressive attacks, eating worker eggs, and signaling via chemicals (called pheromones). At the end of the colony cycle, the queen, males, and most of the workers of the colony will die, leaving a few large females to survive the winter. The following spring, these females will set off on their own to start new colonies. A scene from colony life of the American bumble bee Bombus pensylvanicus. The queen is shown in the center of the photo, surrounded by workers and males. Photo by S.A. Cameron. Alford, D.V. 1975. Bumblebees. London: The Trinity Press. Heinrich, B. 2001. Bumblebee economics. Cambridge, MA: Harvard University Press. Michener, C.D. 1974. The Social Behavior of the Bees: A Comparative Study. Cambridge, MA: The Belknap Press of Harvard University Press. Wilson, E.O. 1971. The Insect Societies. Cambridge, MA: The Belknap Press of Harvard University Press. Winston, M.L. 1987. The Biology of the Honey Bee. Cambridge, MA: Harvard University Press.